I am always on the lookout for new recipes with oats to include it in our daily diet and the oats recipe series justifies it. 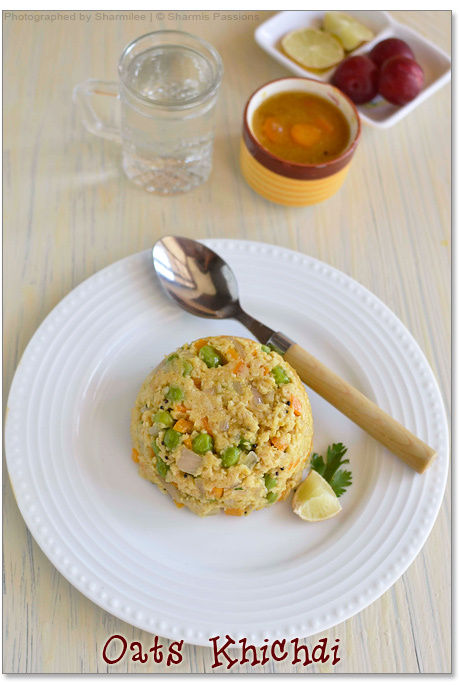 I wanted to try oats upma since long but khichdi overtook though there is only a slight variation between the 2 according to the recipe I make. 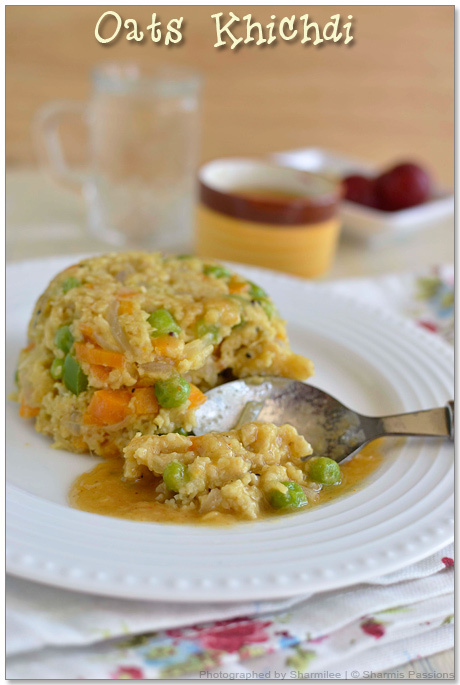 I will sure post a flaky version of oats upma soon. 1.Dry roast oats for 3mins, set aside. Pressure cook carrot and peas just for 1 whistle, set aside. 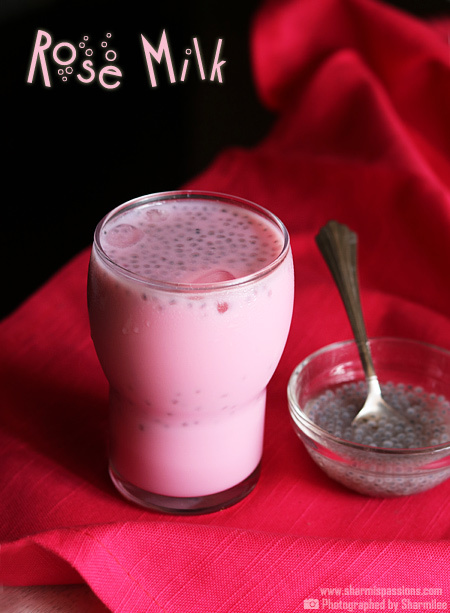 In a pan, heat oil – add mustard seeds, urad dal allow it to splutter. 2.Then add ginger garlic paste,onion and green chilli – saute till onions turn slightly soft. If you are adding tomatoes then add it at this stage and saute till raw smell leaves. Then add cooked carrot, peas and capsicum. Saute for 2mins, then add required salt, garam masala and red chilli powder. 3.Add oats and water give a quick stir, keep covered for a minute. 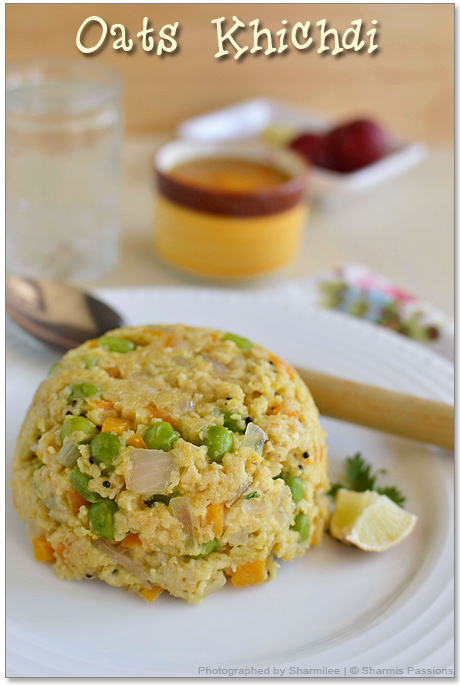 Once oats turns soft and blended well with the veggies, add chopped coriander leaves. 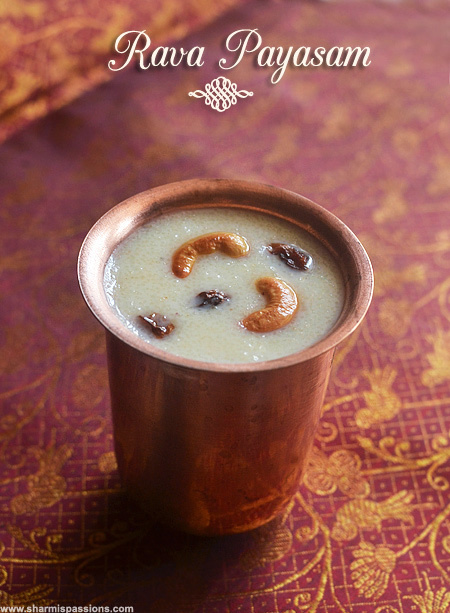 Drizzle ghee and switch it off. 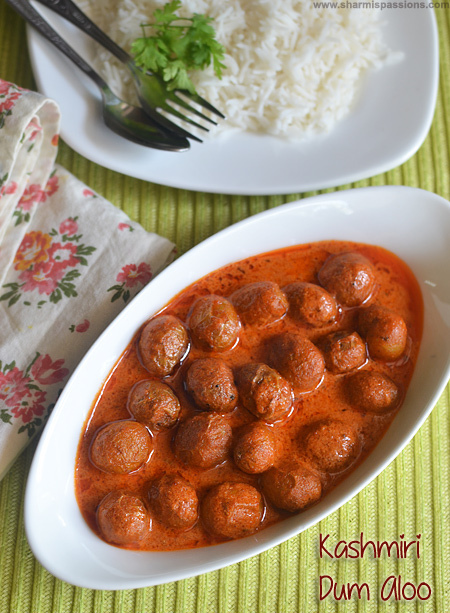 While serving add lemon juice and serve hot with sambar or any chutney of your choice. Adding veggies is purely your choice. I didnt add tomatoes as hubby doesnt like the chunky pieces. You can also add tomato puree instead. 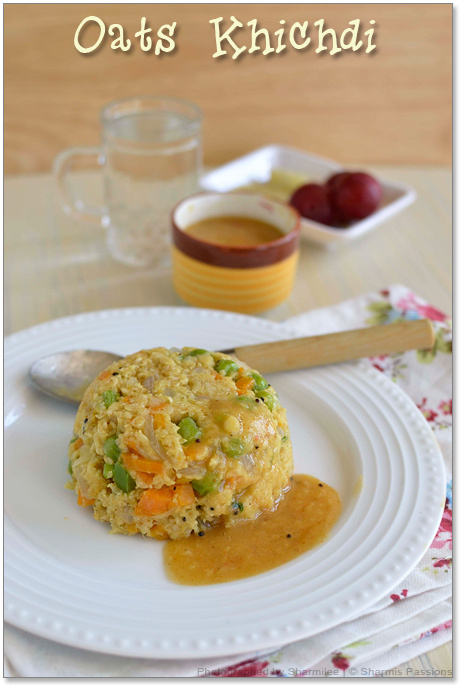 Serve it hot with sambar else noone can eat it as it will turn dry and will not taste good so serving immediately is recommended for oats khichdi. I have a bag of oats sitting in my pantry. I never get to use it. Maybe its time for some ichidi. I have a bag of oats sitting in my pantry. I never get to use it. Maybe its time for some Kichidi. 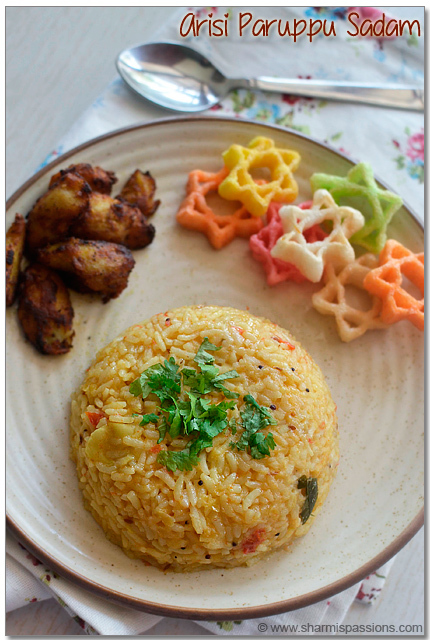 Nice presentation and healthy khichidi. Thats an awesome recipe!!! Healthy and filling !!! 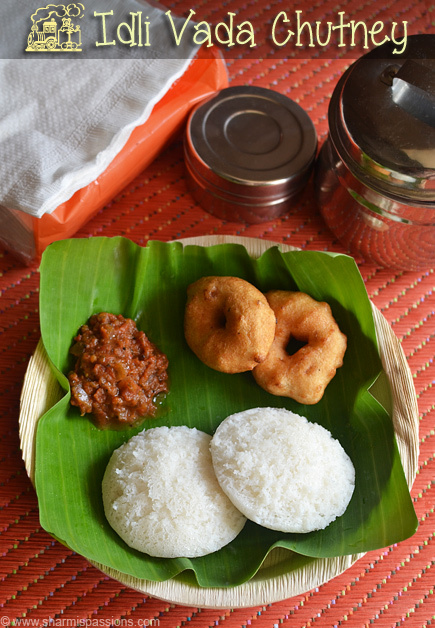 very healthy n filling breakfast…looks so yumm!! neat presentation!! 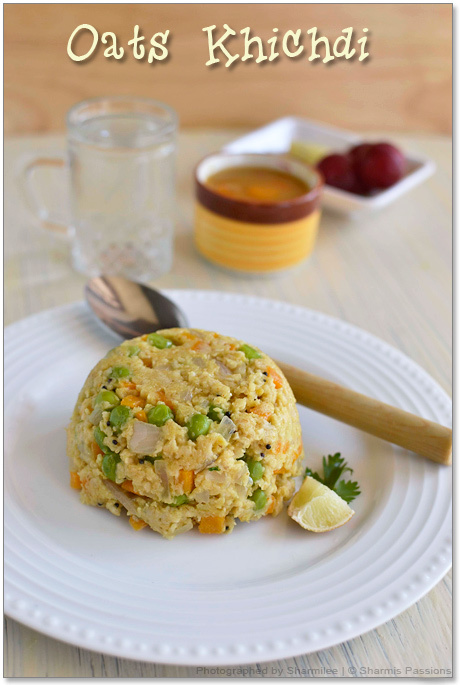 Nice way to have the oats…looks yumm in the pics..
Love this healthy oats khichadi! 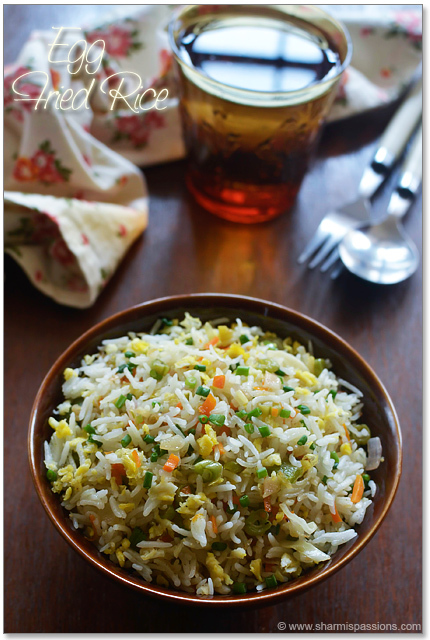 Super healthy and satisfying khichdi. i always wonder how your photos are so neat and clean. everything is so well presented. For your convineance i am giving this URL hope that will help you with my confusion and noted in this article is about bisi bela bhat and pongal too…….. I tried it today n its really yummy. Wanna try … in shaa Allah ! !